Bhutan is the land of myths, spirituality, rich culture, colorful festivals and a pristine landscape. Bhutan is the jewel of the Himalayas. The Bhutanese call it Drukyul, the land of the thunder dragon. But some others also call it Eden. This round trip takes you through the heart of the Himalayas, through Bhutan and Nepal. You will have the time to explore the important religious and cultural sites in both countries, to marvel at the myths, to get in touch with the local people and to be impressed by the panoramas of the most beautiful mountains. Happiness is a place! 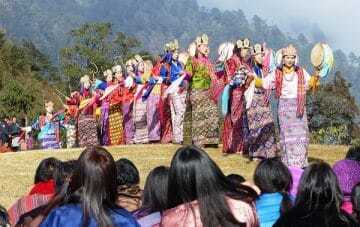 In this tour you will experience the traditions of the Bhutanese, their myths and religion, flora and fauna, and uniquely colourful festivals. You will visit the world-famous mountain monastery of Tiger’s Nest (Taktsang), the wonders of Thimphu and the well-known monastery fortresses of Paro, Punakha and Trongsa. Continuing towards Bumthang you will discover the region’s species-rich and unspoilt flora, as well as places along your route which are untouched by tourism and external influences. 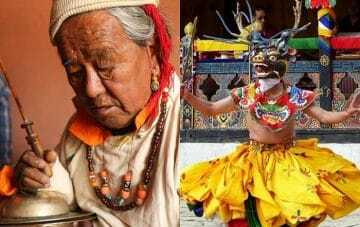 Every day you will immerse yourself a little more in the history and myths of the country, and learn more about the lives of the friendly Bhutanese. Ice giants, a reach flora and colourful diverse cultures – This tour combines trekking in one of the less visited regions in Nepal and culture in the Land of Happiness, in Bhutan. 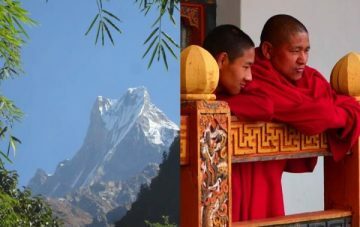 You will have the time to explore the major religious and cultural sites in both countries and, through the trek to the Mardi Himal viewpoint, enjoy the panoramas of the world’s most beautiful mountains. The trip in Nepal starts with a sightseeing tour in Kathmandu and then takes you to the vegetation-rich Annapurna region where you will start your 6-day trek.